Every time Pearl Harbor Day comes around, like many Americans, I remember the people who fought and died on the day that officially started America’s entry into WWII. But, I also remember John W. Harlen. John Harlen was a U.S. Navy 2nd Class Petty Officer assigned to a Supply Depot at Pearl Harbor, Hawaii. I was thinking about John Harlen yesterday as I reflected on December 7th, 1941. Mr. Harlen was someone I had met back in July of 1999 at the church I was attending at the time. I was a bit stunned when I found out he was at Pearl Harbor the day of the attack. I had never met anyone who had been there on that fateful day. Mr. Harlen never talked about that day until he was placed at a hospice facility in 2004. I went there to see him quite often. He didn’t have much time left (Hodgkin’s Disease) and was slowly losing his strength. I went there to see him on a Sunday morning in August of 2004, as I recall. Mr. Harlen, without any prompting from me, related his experience that morning of December 7, 1941. He and five other sailors had been assigned to take an initial munitions load to the USS California that morning at 9AM. As they were preparing to load up, they heard a tremendous explosion from behind the huge supply hangar. Mr. Harlen said it was as if it were a dream…a bad dream. He saw the big ‘rising sun” insignia on the aircraft that was strafing the hangar. Two of the men who were with him that morning were killed almost instantly by either strafing fire from the Japanese aircraft or by shrapnel. Mr. Harlen himself was struck by shrapnel in his back. He was unable to get up and help fight back. 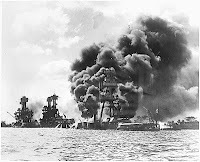 He watched helplessly, in a pool of his own blood, as the Japanese continued their attack near the “party boat” that was to take the munitions to the USS California. He said he never understood why the munitions they had loaded did not explode since it had been hit several times. 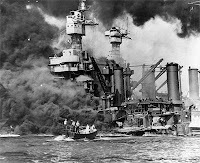 I always think of Mr. Harlen (who passed away about two weeks later) on December 7th, Pearl Harbor Day. I think of him and the many men who died that day. I also remember something else he said; for two weeks after the attack, you could still hear men banging on the hulls of ships to let them know they were alive. But, in 1941, the technology wasn’t advanced enough or safe enough to rescue the men trapped in capsized ships below the water line. He said just before Christmas, the banging stopped. He stated that banging sound haunted him for the rest of his life.